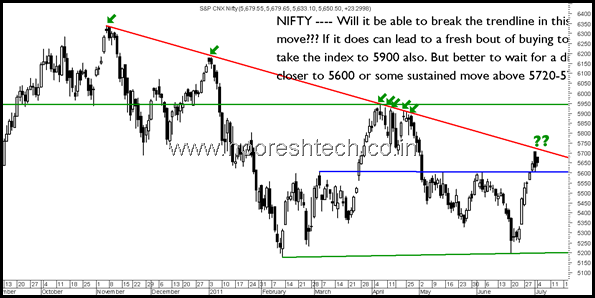 Nifty – Trendline Resistance !!! Will it be able to cross this time ? Above 5720-5740 a breakout. - > The last time around the trendline Nifty kept struggling at 5900-5950 giving hopes of a breakout but ended up in a quick fall. - >Yet again the rally has been quick but it will find resistance at 5720-5740. - > A crossover above 5720-5740 can lead to a quick move to 5900 also. - > Although the ideal way would be to stock specific and wait for a dip to 5600 or sustained move above 5720-5740 to look for a quick trade. - > Bottomline the upmove has been fast and a confirmation move will kill all the bearishness. Wishful Thinking ? But as of now the screen shows no bearishness. -> Even the Bank Nifty is close to a breakout. - > Expect the action to shift into midcaps/smallcaps. 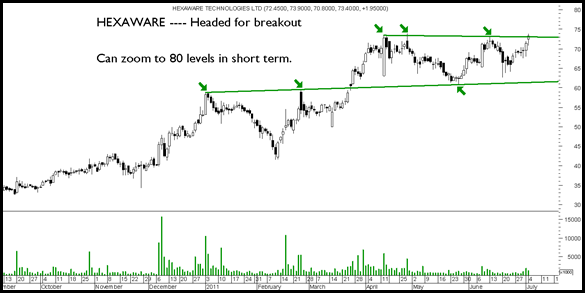 Hexaware – Headed to 80 in short term. If only markets would go up and up, it would be so Easy !! 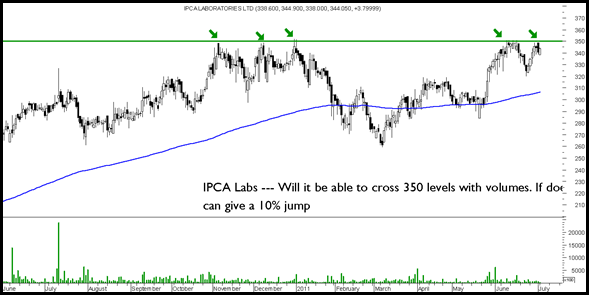 What is ur chart sense on IFCI ? Can you please guide me on Rico Auto? I had bought it some months back at 29 based on a reco in one of your posts. Does it make sense to average it now? 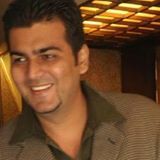 THANKS TO PROVIDE YOUR BEST VIEW FOR MARKET. I ALSO CHECK THE CHART OF HEXAWARE IN YOUR POST IT SEEMS CUP AND HANDLE PATTERN ABOVE 80.